House Republicans want to move their giant tax bill out of the Ways and Means Committee on Thursday. The bill can only add $US1.5 trillion to the deficit over the next 10 years, but the current version adds $US74 billion more than that. Republicans have a few options to fill this gap, including a major change to Obamacare. 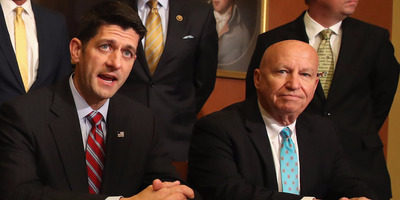 House Republicans are trying to figure out how to fill a $US74 billion hole on Thursday as they make last-minute edits to their sweeping tax overhaul legislation, the Tax Cuts and Jobs Act (TCJA). Republicans are attempting to pass their tax overhaul using a process known as budget reconciliation. But in addition to allowing Republicans to pass the bill in the Senate with only Republican votes, it also means the bill must to abide by certain rules. One of those rules allows for the legislation to add only $US1.5 trillion to the federal deficit between 2018 and 2027. The original legislation released November 2 fit into this window, but an amendment added Monday by the bill’s author — Ways and Means Committee Chair Kevin Brady — pushed the deficit load higher than the allotment. The amendment adopted Monday made a change to a proposed 20% excise tax on multinational companies’ profit movement after an uproar from industry groups. The Joint Committee on Taxation determined that the provision would bring in just $US6.5 billion over the next 10 years, down from the original $US154.5 billion. Other provisions in Brady’s amendment meant the bill would add around $US1.574 trillion in debt over the decade-long window, according to the JCT — thus, the $US74 billion hole. To fix the issue, Brady is expected to introduce what is known as a manager’s amendment — a last-second slew of proposed changes to bill that would in theory bring it under the $US1.5 trillion threshold. One of the most controversial possibilities by which Brady could seek to raise new revenue would be the inclusion of a repeal of the Affordable Care Act’s individual mandate. While this would eliminate the tax penalty for declining to purchase health coverage, a report Wednesday from the Congressional Budget Office showed it would lead to 13 million more people going without insurance over the next 10 years compared to the current system. By lowering the number of people on the Obamacare exchanges, the government would pay out less in subsidies to help people pay insurance premiums. In the end, the CBO estimated this would add $US338 billion in new revenue, which would more than fill the gap in the legislation. Brady has been noncommittal about including the mandate repeal. The Ways and Means Committee kicked off their last day of consideration of the TCJA on Thursday, and the bill is expected to be approved by the group sometime around noon.